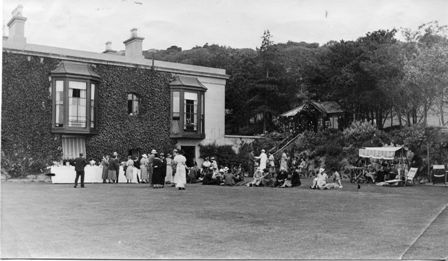 The house at that time was mostly surrounded by fields (see picture opposite). There were a few houses behind it on the upper road (what is now the old Carrickbrack road), but the gardens were not very developed (see the letter below from Betty L'Estrange, one of Sir John's daughters). Sir - It was with great interest that I read in the weekend supplement of June 13th, "One man's way to achieve beauty without backache", written by Ella Shanahan. And I feasted on the beautiful picture. It might be of some interest to keen gardeners to know that approximately 56 years ago my father, the late Sir John Lumsden, bought Earlscliffe from the late Dr Ella Webb. 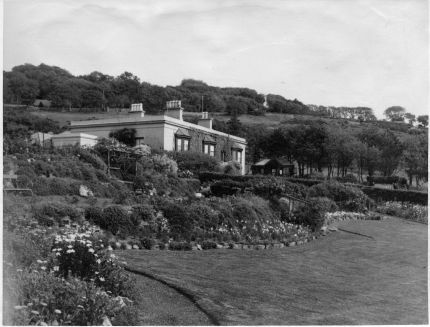 As this superbly sited place of seven acres was virtually shrubless and flowerless, my father set to, to landscape and transform the garden. He had many shrubs planted, not, unfortunately, as beautiful as Dr Robinson's present ones. He also planned several terraces, and in the centre of the main picture one can just glimpse one of the "points" of the St John Cross (my father being the founder and first commissioner of the St John Ambulance Brigade in the Republic of Ireland), the building of which gave my father enormous pleasure. 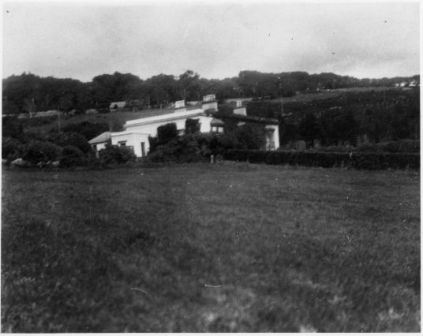 Earlscliffe around 1930 (above), surrounded by fields. After a few years, Sir John had transformed the garden with landscaped borders and many beautiful shrubs and flowers. 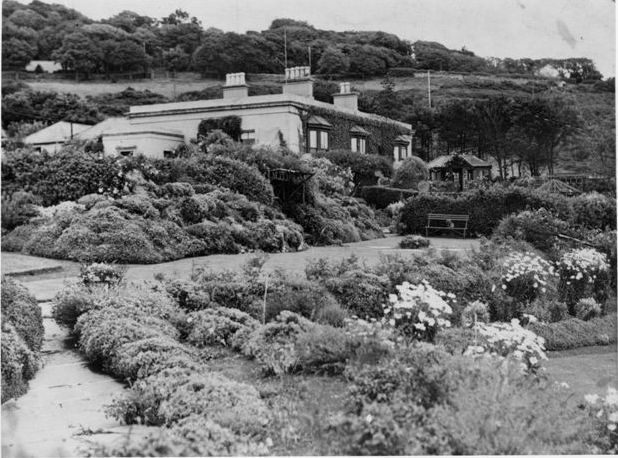 By the late 1930s the gardens at Earlscliffe had become more established (see picture below). Sir John also built a sundial in the shape of a Maltese Cross (the symbol of the St. John Ambulance Brigade). 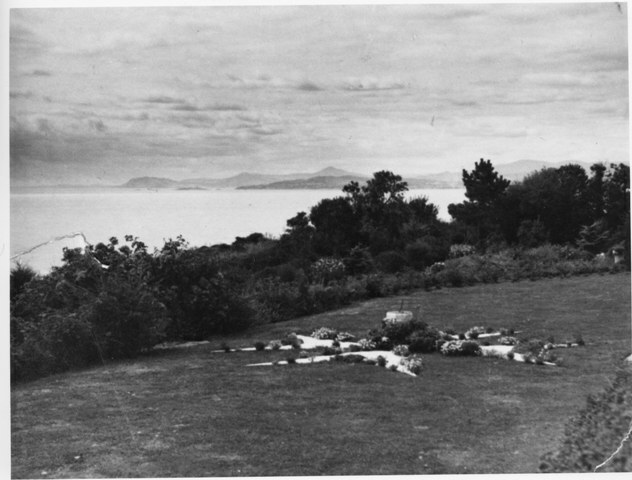 The sundial and the views across Dublin bay to the Wicklow Mountains can be seen below. From what we can gather, Sir John enjoyed his 'retirement' years  at Earlscliffe, and hosted many social gatherings there. Some examples can be seen in the photos below. 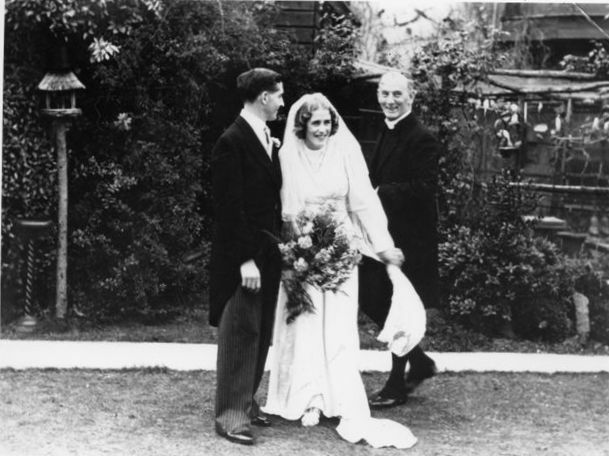 There are also a number of Lumsden family photos taken at Earlscliffe available in the following pages; Photo set 1 and Photo set 2. Also, we had a visit from Sir John Lumsden's grandson, John Radcliffe and his wife Sheila on Thursday 23rd April 2009. John had some great stories to tell of the Lumsden family and was interested to see some copies of photographs we have from a Lumsden family album which we believe might have come from Sir John's daughter, Betty L'Estrange (see Photo set 1 and Photo set 2). This was confirmed by an advertisement in the Irish Times September 20 1930 is for a "comfortable, furnished house to let October to May; three receptions, six bedrooms, etc., electric light, telephone, garage; sheltered, lovely southern view. Apply Lumsden, Earlscliff, Baily"
 An example of the concerts that Betty use to perform at can be seen in an advertisement in the Irish Independent, February 28, 1939 for a concert with the Radio Éireann Irish Radio Orchestra. An article in the Irish Independent, November 16, 1939, pg 7, describes the annual show of the Yorkshire Canary and Cage-bird Society of Ireland which was held in the Gregg Hall, Dawson Street, Dublin and was opened by Sir John, who was the president of the society. 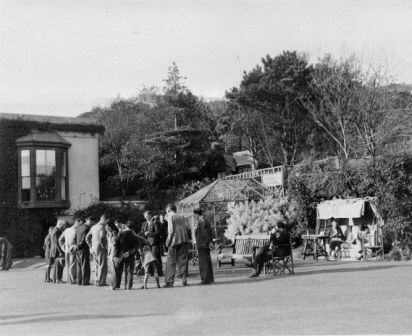 He also won three prizes for his blue, cobalt and white budgerigars.